Courtesy of Mary Genovese Colvin, Compass Pennsylvania, LLC. 500 Walnut , Philadelphia’s most exclusive residential tower is located directly across from Independence Hall and the surrounding parks. Developed by the acclaimed Scannapieco Development Corporation, developers who have garnished a reputation for being Phila’s ultra-luxury developer, this tower will feature only 34 residences for the ultimate in privacy, a fully automated parking system of 85 spaces including the country’s first induction charging for electric cars and a host of world class amenities including a guest suite and a 4,000 square foot treetop terrace overlooking Independence Hall. There will be a full service concierge and doorman as well as a Tesla town car and driver available to take you wherever you need to go within the city or to the airport or train station. All designed to create a wonderful lifestyle without compromising space. 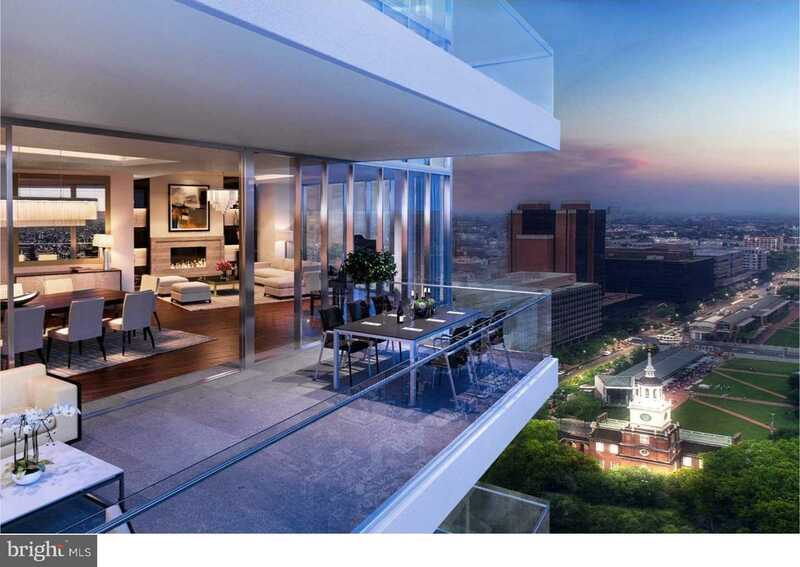 Take one of the high speed priority service elevator that will open to your private foyer which serves as the entrance to this spectacular This 4300 square foot residence with unprecedented views of the birthplace of America to the north, the river to the east and the sun drenched views to the south. The condo will feature, high ceilings, floor to ceiling windows, a vented gas fireplace, 3 bedrooms, plus a den that could be a fourth bedroom and there is a media room as well, laundry room and 3.5 baths. There are two terraces, one to the south off of the master bedroom perfect for enjoying that morning cup of coffee and an expansive 20 foot long by 8 1/2 foot deep balcony off of the main living perfect for entertaining. This is city living with the luxury of spaciousness. While 500 Walnut offers a choice of exquisite floor plans, they also recognize that you may have your own ideas. That’s why they are the only developer in Philadelphia who invites you to have your own architect work in tandem with their team to help you create a home that is unmistakably yours. 500 Walnut is the perfection of every concept of luxury living that has gone before it. The stately building sits elegantly at the corner of 5th and Walnut Streets and is in close proximity to the neighborhood’s best restaurants, cafes, boutiques, cutting edge design stores, and all major transportation. Enjoy style, comfort and convenience right in the heart of Society Hill’s most sought-after zip code! Call for appointment ? Please, send me more information on this property: MLS# 1009992288 – $6,250,000 – 500 Walnut Street Unit 1500, Philadelphia, PA 19106. I would like to schedule a showing appointment for this property: MLS# 1009992288 – $6,250,000 – 500 Walnut Street Unit 1500, Philadelphia, PA 19106.